Before diving into this gigantic list of brilliant people, be sure to check out the (also brilliant) nominees for the MyTV Awards, MyCinema Awards and MyTheatre Awards in London, New York and Boston. MyTheatre’s Toronto branch makes up the largest portion of our site-wide awards season by a pretty large margin. Without even factoring in ensembles and production teams, more than 200 individual theatre artists are nominated this year for their work in Toronto, Stratford and Niagara-on-the-Lake, many of them first-time nominees. Pulling together the suggestions of our entire staff of reviewers from notes kept throughout the year, we’ve selected 5-7 nominees in 35 categories across 3 divisions and there’s even more to come when we announce the winners of the Emerging Artist, Fan Favourite, Performer of the Year and Honorary Award. You may notice that this year we’ve divided up the categories a little bit differently. Rather than the usual indie & professional divisions (which never made sense to us since independent artists are also professionals), we’ve designated each company as either “large”, “medium” or “small” based loosely on budget, audience size and number of shows produced per year. It’s an inexact science but we’ve tried to be as fair as possible to create even playing fields and include as many different artists as possible. We also changed the word “Best” to “Outstanding” because “best” just isn’t a possible thing. Our Editors and Staff Writers all get a say but we use your votes for tie breakers and to choose a Fan Favourite so be sure to share your thoughts in the comments section, on Facebook and Twitter using the hashtag #MyTheatreAwards. 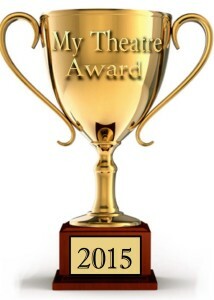 Winners will be announced at the annual MyTheatre Award Ceremony & Party on March 21st, 2016. We’re back at The Great Hall this year with plenty of food, live music (of both the cocktail and dance party varieties) from our signature band Hand-Picked Favourites and the main event hosted by the incredible duo of Ryan G. Hinds & Kat Letwin! We try our best to cover as many aspects of theatre as we can. In recent years, that’s meant expanding our design and technical categories, adding awards for improv/sketch and solo performance, and moving from two to three divisions to accommodate budget disparities. We’ve used the Emerging Artist and Honorary Awards to celebrate theatre artists who perform roles not covered by the nominated categories like Artistic Director, Producer and Fight Director. But we’ve never quite figured out how to give Stage Management its due. A good stage manager’s work is difficult to appreciate from the audience; we can’t see how tight a ship they run in rehearsal or how many fires they put out along the way. So we decided to create this award and turn it over to the people who do see those things- other theatre artists. Here’s how this will work: if you worked with an incredible stage manager in Toronto (or at Stratford or Shaw) during the 2015 season, we want to hear about them. Send an email to editors@myentertainmentworld.ca with the subject line “SM Nomination: NOMINEE’s NAME” and describe in 100 words why you think they deserve to win (*Please only submit one nomination and respect the word limit). Make sure to include the production details and the nominee’s email address. The winner will be announced with the rest of the awards at the party on March 21st, so make sure your nominee shows up! Don’t forget about our annual Nominee Interview Series. If you’re nominated this year (including ensemble and production categories), email editors@myentertainmentworld.ca to sign up.